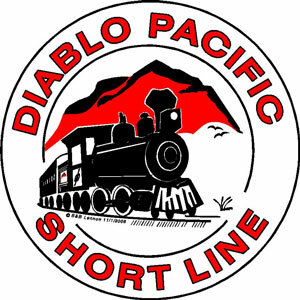 Take advantage of a unique marketing opportunity to lease a rail car on the Diablo Pacific Short Line, a portable large scale railroad. With 20-30 exhibit days each year, at regional parks, community events, model train shows and hobby shops. The rail car will be viewed by over 10,000 people a year. * Increase your company or organization’s visibility by placing a logo, or requested graphics, on a train car which will be visible to the general public at multiple events throughout the Bay Area. * You may wish to use this program for a personal message, such as for birthdays, weddings and accomplishments. * You may supply your own digital art work or application-ready graphics. If not we can assist you with creating an appropriate design. If we help with the graphics all designs will be preapproved by your business before final production of your car. Your store, company or organization may choose a background color to complement your art work. This color must be approved by the Diablo Pacific Short Line. See examples shown in our accompanying photos. * At times, your train car may be displayed in the window of our current club space. * The Diablo Pacific Short Line displays at 15-20 different events each year such as Alamo Plaza shopping center, model railroad events, trade shows, parks and other celebrations all over the Bay Area. We will take YOUR car to these events and people who attend these events will see your train car on display. * Your car will be up and running within 3 weeks after the approval of the final artwork. * Your leased car will then be on display at all events where DPSL displays. * At the end of your third year leasing the car, the car becomes your property and you can take it home or we can continue displaying at no cost. Maintenance and/or upgrading of the car for the duration of your lease, regardless of ownership, will be the responsibility of DPSL as long as it’s in the possession of DPSL. * As part of the car promotional program, we can also display business cards or flyers for your company or organization and you will be listed as a sponsor on our web page for as long as your participation is active. * The cost of your participation is $250 dollars for the first year. Subsequent years are $200 per year. The first year includes the cost of the train car and its preparation. * A second car may be leased at $150 per year. * You may pay by credit card, check or cash. * We are a 501(c)(3) tax deductible corporation.